It’s amazing how projects start. Westbury resident John Fryer remembered a small, narrow patch of land close to All Saints Church as a Quaker graveyard, long abandoned and now covered in weeds, rubble and rubbish. The only clue to its former use was a strangely shaped stone grave marker, half buried in the debris. 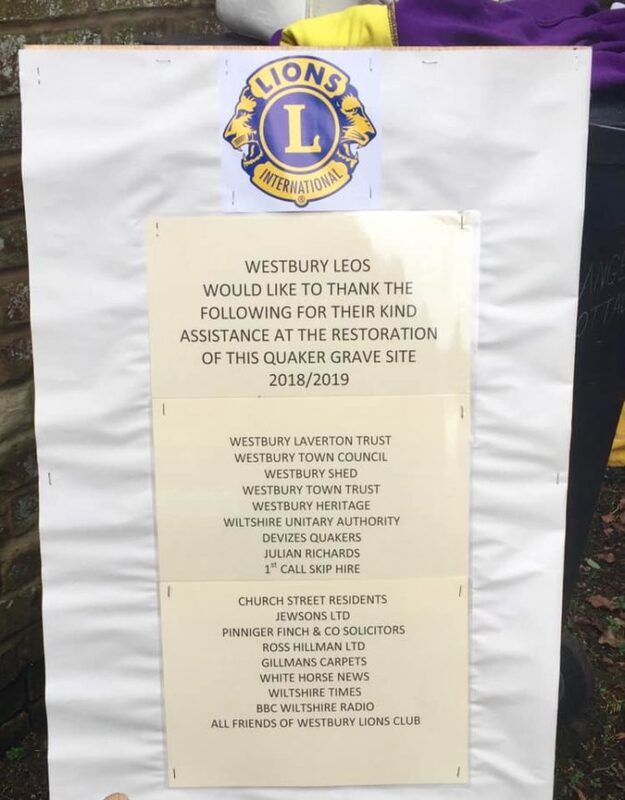 John’s requests to tidy the site up were eventually answered by the Town Council who asked Westbury Lions if it was a project suitable for their Leos. The challenge was eagerly taken up – could this lost piece of Westbury’s history be rescued from obscurity? Archaeologist Julian Richards was invited to provide professional supervision of the clearance work and so, with the Westbury Leos providing the labour force, work began in February 2018. As soon as digging started it became obvious that the graveyard was buried far deeper than was initially thought, hidden under accumulated soil from years of vegetation, mixed with bottles, cans and building debris. It was clearly going to be a much bigger project than had been anticipated but the whole Westbury community rallied round. Pinniger Finch the solicitors allowed access and the use of their carpark for builders skips which, alongside materials that were needed, were paid for by various donations and grants from the Town Council, Wiltshire Authority, Westbury Lions and other agencies. their grave in such an elaborate way. 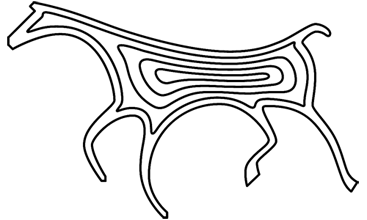 Research carried out into the burial records by Sally Hendry, the Town’s Heritage Centre historian, showed that this small graveyard had been in use from the 1740’s into the 1800’s, and that there were another 15 unmarked burials in addition to the marked graves. 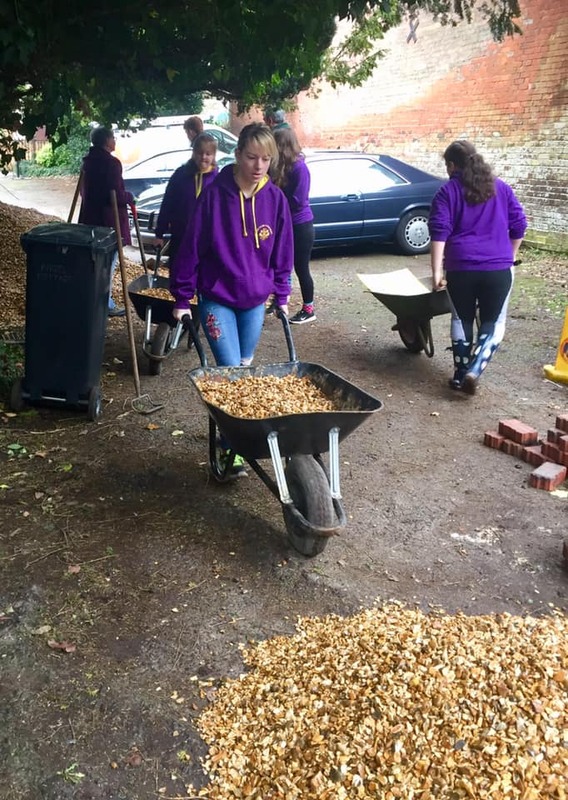 As the work progressed over the course of several Saturdays, a field kitchen appeared, manned by the Lions, to refresh workers and visitors with bacon rolls, doughnuts and hot drinks. 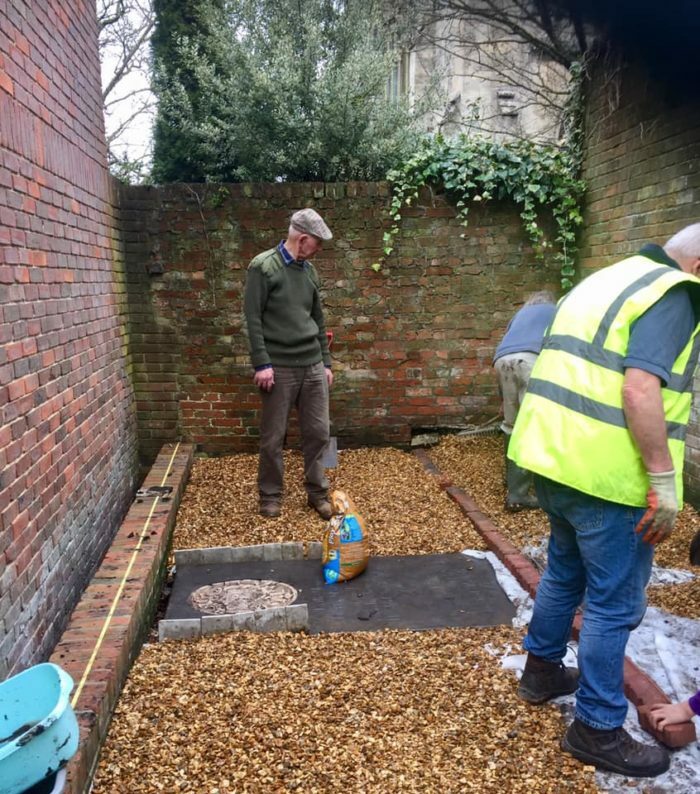 Eventually seven skip loads of soil and debris had been taken away and the graveyard was down to its original level, complete with the remains of an original brick-edged path, another Leos discovery. The line of this path was marked out with specially purchased bricks while John Fryer, now a member of the ‘Westbury Shed’ built a new brick wall to mark the edge of the site and also created a better access. 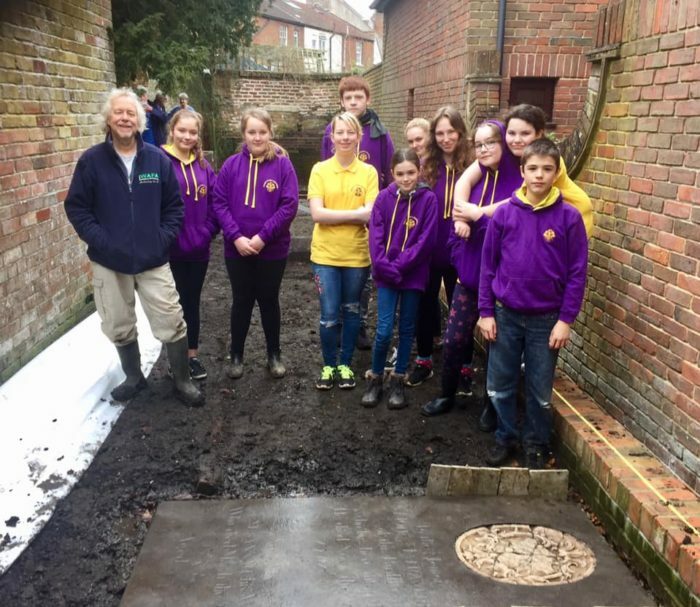 A raised flower bed was created at one end of the burial ground and finally, in January 2019, the site was neatened up with 10 tons of gravel (all barrowed in and laid by hand). Much as everyone would have loved to leave the Matravers gravestone on view, frost and rain would have caused it to deteriorate and so it was carefully protected and covered over. 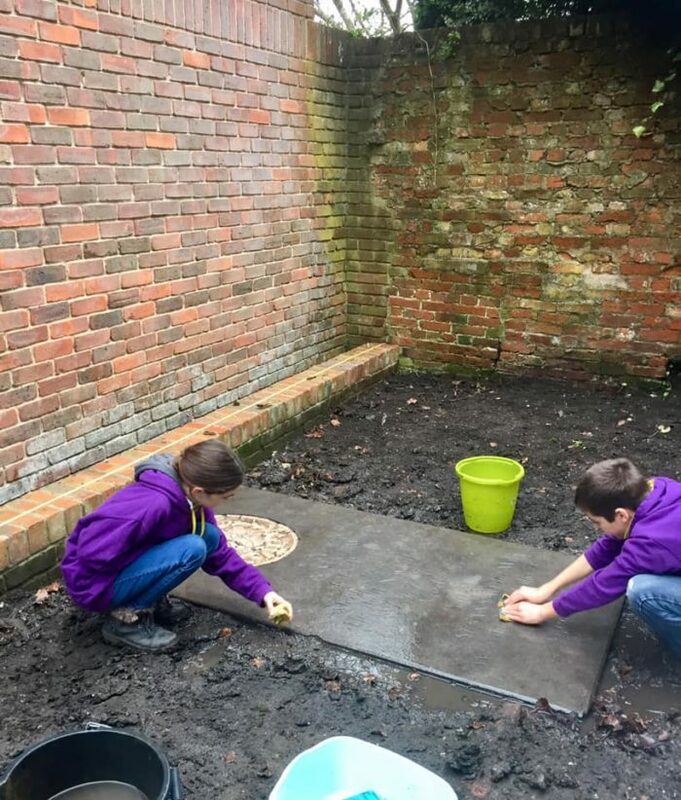 As there is no Quaker church in Westbury, Devizes with their north east Somerset members have commissioned a special plaque which will commemorate the importance of this site and the effort that went into its restoration. 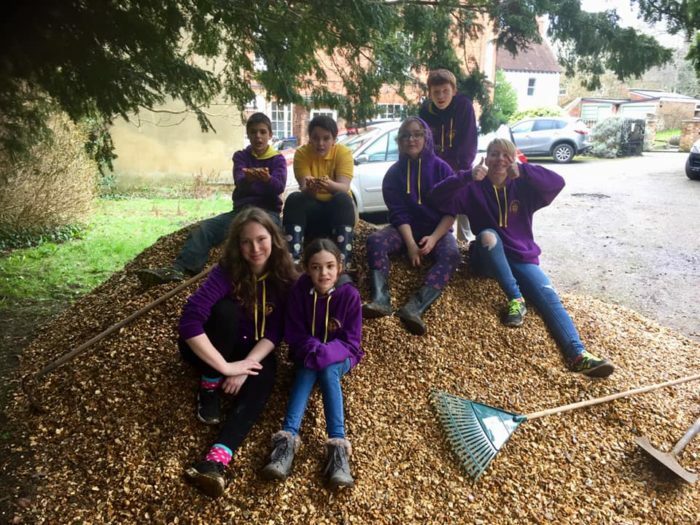 Over the year this had been a real community project, featured in the local press and BBC Wiltshire radio, uniting old and young the joy of discovery and in hard work to create something very special. The Quakers are delighted that it is now a space which, as they put it ‘can be used by anybody for quiet contemplation, something which is very much in the Quaker tradition’.